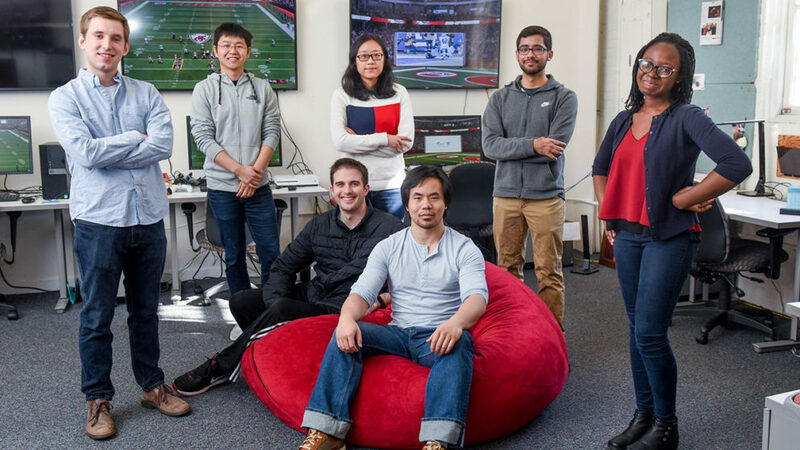 With investment capital from NC State’s 2017 Lulu eGames, a team of statistics graduate students and undergraduate design students called Ataristicians develops games and videos to help high school students understand and appreciate the value of statistics. A year ago, the Atartisticians entered the Lulu eGames for the first time and came away with an impressive $10,000. 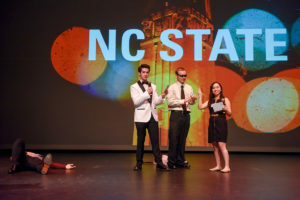 The eGames are an NC State competition where student entrepreneurs vie to win investment capital for their businesses. The Ataristicians hope that their gaming approach can make statistics fun for high school students, and maybe even encourage them to study statistics in college. It’s a response that doesn’t really surprise Eric Rose of the Ataristicians. “When I tell people I’m a Ph.D. statistics student, people say, ‘oh, I hated statistics.’ That’s the common response that I hear all the time,” Rose said. But like his fellow students, Rose believes that more students would be drawn to statistics, if they knew about some of the hidden ways that statistics are involved in our everyday lives. This graduate student-led project grew out of professor Eric Laber’s statistics labs. The Ataristicians’ success in last year’s eGames provided enough capital to hire some additional gaming designers – undergraduate design students – to continue developing the games. Seven graduate students in statistics and three undergraduates entered the eGames for the first time last year. They placed in three categories, earning nearly $10,000 in venture capital for their efforts. They also won the competition’s video contest, with a fun video about their projects. Several graduate students are among the teams participating in the 2018 eGames. The teams and graduate students are: Upstream Biotechnology (Adam Fisher); Cao Hydrogen Electrolyzer (Oscar Llama, Jake Trimble, Frankie Womack and Adam Reed); Mitramag (Oscar Llama, Jake Trimble, Frankie Womack, Benjamin Tennant and Adam Reed); Vital Guide (Anthony Workman); Workout@Work (Jelyse Dawson); Tueri (David Majeski); and Wyker Designs (Laura Wyker). Much of the Ataristicians’ recent efforts have focused on helping high school students. The games they develop are just for fun, but have an element of artificial intelligence – as players play the game, the game “learns” and adapts to each player’s strategy. Teaching videos that accompany the games explain the statistics behind the games’ artificial intelligence. A video demo associated with the Laser Foxes’ game explains the game this way: the viewer is the blue fox, and the orange fox is played by the computer. “In the beginning, the computer is easy to beat! But the AI gathers data as you play. The data tells us if you play aggressively or defensively. The AI then evaluates a counterstrategy against your individual playing style,” according to the video. Then, watch as the orange fox becomes much more difficult to beat. The students have support for the idea that games might be the right way to present statistics. The American Statistical Association has supported the Ataristicians’ development of two digital “summer camp” modules on statistics. Student “campers” can explore statistics through the camps, and at times, statistician “camp counselors” will be available online to support the campers’ learning. Ataristicians started out around 2015 with a research project by team member Marshall Wang. Rose isn’t sure what the future holds for Ataristicians. As more experienced team members graduate, others step in to work on new projects, so the team continues. He does believe in the inescapable need for people to understand statistics. Bringing new students into the field motivates the team to continue developing the games and videos. Even watching the news, viewers need to understand statistical data references that come up regularly, he said.